Dutch by design, big in attitude and peerless in class, we're the new school for time. Unashamed to be different and taking strength from size, we've carved a new timeline in the watch market since our arrival in 2005. We make no apologies for resisting the norm and neither do those who choose to stand tall and wear our time. There's an art to being bold with style, it takes confidence and character to stand alone...it's not a watch, it's a statement. Time doesn't rest and neither do we; our innovative design is in perpetual motion, keeping us one step ahead of the pack. We are TW Steel. 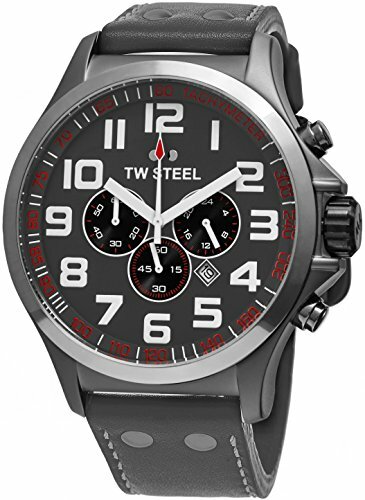 Brushed sandblasted titanium PVD plated stainless steel case (45 mm in diameter, 13.5 mm thick), Screw-down case-back with embossed TW Steel logo, Polished titanium PVD bezel, Dark grey dial with TW Steel logo at the 12 o'clock position, White luminescent hands and Arabic numerals, Small seconds sub-dial at the 6 o'clock position, Date window at the 4 o'clock position, 24-hour display at the 3 o'clock position, Chronograph function features a sweep seconds hand and 60 minute counter at the 9 o'clock position, Tachymeter scale displayed around the flange, Mineral crystal, Quartz movement, Miyota caliber 0S20, Water resistant to 5 ATM/50 meters/165 feet, Grey leather strap with grey stitching, Pin buckle, Model number: TW422. If you have any questions about this product by TW Steel, contact us by completing and submitting the form below. If you are looking for a specif part number, please include it with your message.